T. Ransfield, National Publicity Studio photograph: Sarjeant Gallery interior with the Wrestlers, black and white photograph, June 1958. Collection of the Sarjeant Gallery Te Whare o Rehua Whanganui. Printed off a negative from the National Library of New Zealand collection. 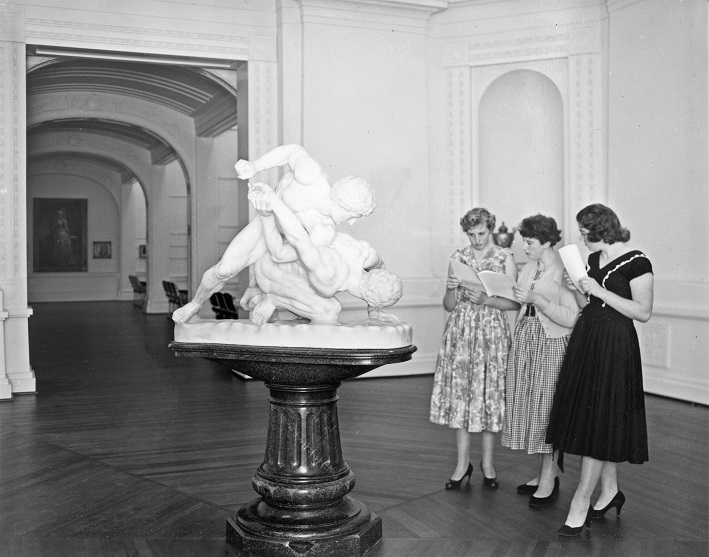 When the Sarjeant Gallery opened in September 1919, the gallery beneath the dome was devoted to the display of sculpture. By the early 1920s, the centre of this gallery had become home to The Wresters, a marble copy of a Greek original from the studio of Professor Raffaello Romanelli in Rome. This sculpture remained at the heart of this space until December 1979, when a project by artist Billy Apple displaced the work to a smaller room near the entrance to the gallery. The resulting exhibition, Toward the Centre, presented eight framed pictures accompanied by text that documented the action of removing the sculpture from this central position and it’s rationale. Toward the Centre was the first in a series of over 30 artworks and installations that would be created specifically for this space in the decades that followed. Among the artists who have taken up the challenge in recent years is Joanna Langford. Down from the Nightlands (2007) saw the gallery transformed into an uneasy dreamscape of rickety towers and impossibly steep flights of miniature stairs that stretched upwards into the space of the dome. The last in the series to date, Comeback, was created by graphic designer and handwriting artist Sarah Maxey in 2012. The historical significance of the Sarjeant Gallery building in Queen’s Park is recognised today at both a national and local level. 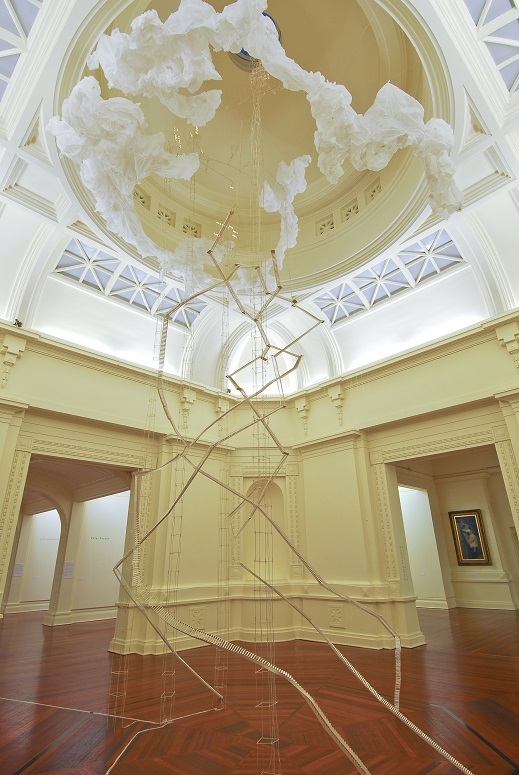 The earthquake strengthening and redevelopment of the building will not only preserve this architectural treasure and enable it to provide a safe home for the Gallery’s collection that meets twenty-first century standards, but also to keep on inspiring and challenging contemporary artists and their audiences for many years to come.